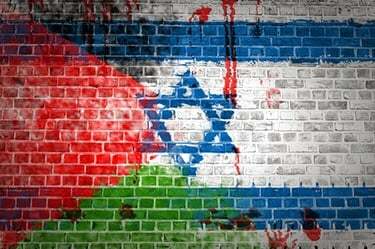 The establishment of the State of Israel in 1948 has been followed by decades of bloodshed. Hundreds of thousands of Palestinian Arabs were evacuated from their homeland to make way for the new Jewish homeland. Hundreds of Palestinian villages wiped off the map. A nearly 50 year occupation of the territory known as the West Bank continues with infrastructure servicing Israeli settlers over the Palestinians who have lived there far longer. The destruction of civilian infrastructure in Gaza. And the demolition of Palestinian homes. All enforced through the violence of the Israeli State. Defenders of Israel argue these measures are necessary as self defence against terrorists. They allege for instance that if Canadians or Americans were subjected to the same degree of terrorist attacks which have plagued Israelis, they would sanction violent force in the name of protecting the innocent. Palestinians and their advocates put forth a different narrative. They argue the Israeli State has been implementing violence against the Palestinians on an ongoing basis. Israel stands in violation of international law through its activities in the Occupied Territories. Palestinian-based insurgencies are responding to Israeli terror, not the other way around! Despite (or possibly because of) US-brokered peace talks, the conflict seems to have gotten intractable. What are the prospects for peace in the region? This week’s Global Research News Hour explores this question with two prominent critics of Israel. Dr. Jeff Halper is the co-founder and Director of the Israeli Committee Against House Demolitions (ICAHD). He is also a Nobel Peace Prize nominee, and the author of four books including his most recent “Obstacles to Peace: A Reframing of the Israeli-Palestinian Conflict.” In this interview, recorded during his cross-Canada tour in early 2015, Halper cuts through the perennial meme of Israel as victim, explains his belief that the Two-State solution is essentially “dead,” and reflects on the success of non-violent strategies such as the Boycott-Divest-Sanction movement and how they compare with the international efforts to end South African Apartheid. Click here for a list of cities Halper is visiting in February. Yves Engler follows Halper in the second half hour of the programme. The Ottawa and Montreal based activist and author of Canada and Israel: Building Apartheid among other books interprets the modern overtures of partnership between Canada and Israel including a Memorandum of Understanding “to counter the boycott, divestment and sanctions movement.” He attempts to determine how or if other aspects of Harper’s economic, military or security agenda are advanced by these agreements.